Flip was one of the primary recurring characters in Winsor McCay's Little Nemo in Slumberland. His initial role was to surprise Nemo awake by bringing his uncle, the Dawn. He and Nemo eventually became friends, however, and Flip acted as a sort-of guide/sidekick/Greek chorus, both getting Nemo into trouble with his recklessness and mischieviousness, as well as commenting on some of Slumberland's oddities. 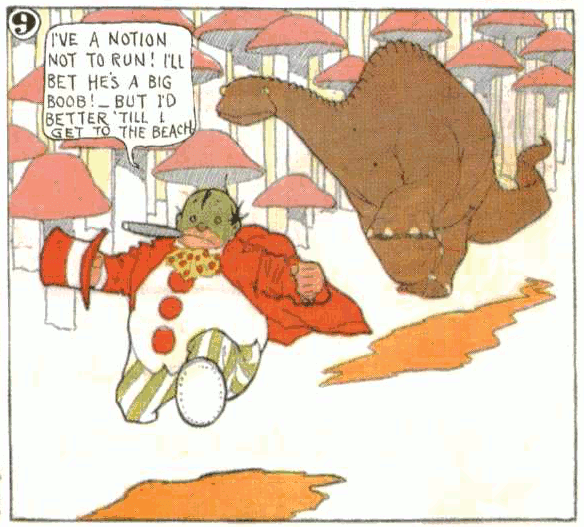 I don't recall when/where I first saw Little Nemo and/or Flip. I didn't really start studying the strip until the late 1990s, and I don't think I read it through its entirety until 2001 or 2002. But I'm certain I'd seen some examples of the strip before then, probably in some general history of comics pieces I'd read. I recall being surprised, though, when I came across a sequence where Flip is stripped down to his boxers showcasing his very pale skin. My surprise was in that he wasn't Black. The strip was created in 1905, and while it's gorgeously rendered, it does contain more than a few... let's say less-than-generous depictions of Black people. Notably the Imp and the other denizens of Candy Island. I know that when I first saw those drawings, I was old enough to be aware that McCay was using some ugly stereotypes of his day. But he at least seemed to use a couple different stereotypes. When I looked at Flip, I saw him as another caricature of a Black person. His hair was largely hidden by his hat, and the only skin normally displayed was his face. And while it was colored green, his mouth and chin were exaggeratedly pale in the same manner as someone in Blackface. Coupled with the his clown-ish/minstrel attire, I assumed Flip was simply a bad caricature of a Black person. When the Imp showed up in brown skin, my thought was that was just another bad stereotype -- the Imp as a "traditional" African and Flip as an Americanized one. What I didn't realize was that, in the 1800s and early 1900s, the stereotype of the Irish was phenomenally bad. I knew they'd be saddled with an image of drunkards, but I had never seen/heard that they were actually considered a "lesser" race by some people. In fact, it doesn't all that much searching to find cartoons of the day belittling the Irish as decidedly inferior, only marginally better than Blacks. 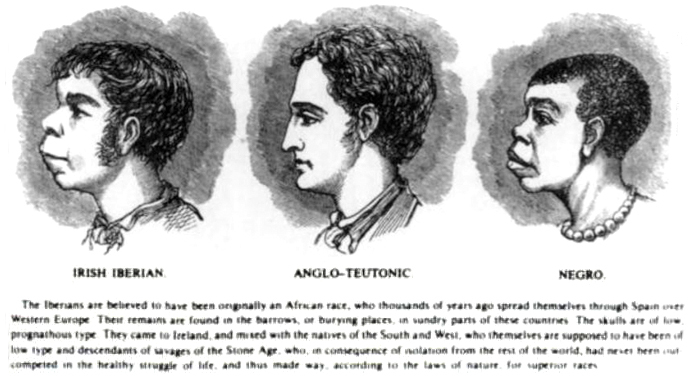 There were even articles discussing how the Irish might be a kind of "missing link" between Blacks and Caucasians. This article is provides an excellent summary of how Irish people were depicted throughout the 19th century. So the visual cues I was seeing in Flip were indeed reminiscent of cartooning tropes used for depicting Black people, but only because society at the time conflated the two "races" pretty closely with one another. This also explains why Flip is treated badly by many other characters, most notably the Princess, but still better than the Imp. There's a very clear racial hierarchy on display in the strip. I bring this up because, here in the 21st century, I don't think we hear much about that brand of Irish stereotype. We fortunately don't see much Blackface either, but it is still around, so I think modern audiences can recognize that in the depiction of the Imp. But I suspect that, unless you're specifically studying McCay and/or cultural tropes of a century ago, the particular ugly stereotype embodied by Flip is likely lost on most people. It certainly not a good look for McCay. He was a wonderfully talented cartoonist, and it's a shame he resorted to such visuals. But at the same time, that the Irish stereotype he tapped into is mostly forgotten can be taken as a point of hope. That maybe, just maybe, we can get past the racial problems we continue to see every day.